In the mid-nineties, New York’s Lower East Side contained a city within its shadows: a community of squatters who staked their claims on abandoned tenements and lived and worked within their own parameters, accountable to no one but each other. On May 30, 1995, the NYPD rolled an armored tank down East Thirteenth Street and hundreds of police officers in riot gear mobilized to evict a few dozen squatters from two buildings. With gritty prose and vivid descriptions, Cari Luna’s debut novel, The Revolution of Every Day, imagines the lives of five squatters from that time. But almost more threatening than the city lawyers and the private developers trying to evict them are the rifts within their community. Amelia, taken in by Gerrit as a teen runaway seven years earlier, is now pregnant by his best friend, Steve. Anne, married to Steve, is questioning her commitment to the squatter lifestyle. Cat, a fading legend of the downtown scene and unwitting leader of one of the squats, succumbs to heroin. The misunderstandings and assumptions, the secrets and the dissolution of the hope that originally bound these five threaten to destroy their homes as surely as the city’s battering rams. Amid this chaos, Amelia struggles with her ambivalence about becoming a mother while knowing that her pregnancy has given her fellow squatters a renewed purpose to their fight—securing the squats for the next generation. Told from multiple points of view, The Revolution of Every Day shows readers a life that few people, including the New Yorkers who passed the squats every day, know about or understand. 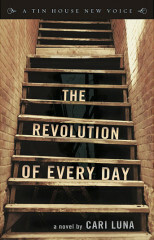 Cari Luna is the author of The Revolution of Every Day, whichThe Oregonian named a Top 10 Northwest Book of 2013. 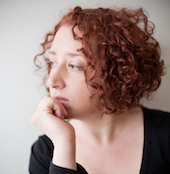 She is a graduate of the MFA fiction program at Brooklyn College, and her writing has appeared in Salon, Jacobin, The Rumpus, PANK, Avery Anthology, failbetter, Novembre Magazine, and elsewhere. Cari lives in Portland, Oregon. Amelia rides uptown in the creaky old van driven by Jeremy, that creaky old hippie. Suzie is up front in the passenger seat and Amelia bounces along on the bench seat, the city slipping by them in red and white and neon, the city such a different animal when you cut through it by car. Moving fast, away from the sound and smell of it, and it’s swift and layered and beautiful. Especially on a winter night like this, late enough and cold enough for most of the people to be tucked away, and it’s just you and the cabs and the late-night streets and the lights, and you remember why you love this city. Easy to love her again. To look out the window and find the Empire State Building all lit up and the Chrysler Building up ahead and gleaming, and it’s enough to make Amelia go all heart-full and giddy. Enough to make her want to reach out and embrace it all.